One night at a local county park, I lay on the ground staring up through the tree at the moon. I thought about how the moon’s energy affected the tides and people. 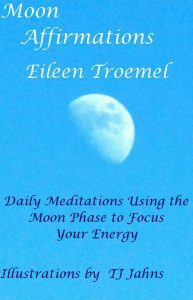 As I lay there I thought about the different phases, how the phases represented different energy and how I could use that energy in my life. To reach the greatest of heights. Each night you meditate, take the time to relax, be comfortable, and prepare yourself as described in the For Beginners section. Sit in the dark. Listen to the sounds around you. Identify each sound. Make the sound a part of the background web in your life. Breathe in deeply, slowly release the breath. Continue slowly breathing until each sound becomes like your breath; an automatic part of your being. Visualize yourself at the center of a circle. Leading away from the center are many paths. Slowly turn around seeing each path leading away. As you turn, one path may draw you, look down the path. What do you see? Take time to complete the circle. There may be more than one path which draws you, determine which has the strongest pull. This is a night to see the options available to you. Take time to consider each possible path. It is the beginning of birthing a new life for you. When you are through, ground and balance yourself. Allow your awareness to return to where you sit. Become aware of the ground or furniture you are sitting on and your physical surroundings. Bring your awareness back to your physical body. As you become more aware, rest your hands on the ground and allow yourself to feel your physical surroundings. This will help bring your energy and awareness back to a centered and balanced place. When you meditate it is very important to bring your center back to your physical being. Ground yourself in one of the ways suggested in the For Beginners section.